Hi guys! Glad you liked my Breakfast Cookie How-To post. Get ready for another breakfast How-To tomorrow! 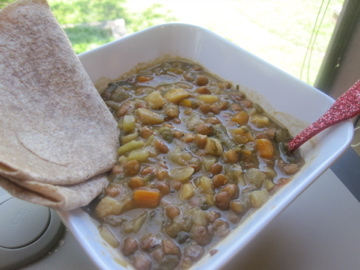 Today’s lunch was a can of Amy’s Light Sodium Lentil Vegetable Soup and a whole wheat tortilla. I normally don’t eat a lot of soup in the heat of summer, but I bought this can last night in case my stomach didn’t feel better today. It was my first time trying it and it was really good. I love that the lentils are so filling. A crunchy apple was the sweet ending I needed after a salty soup. 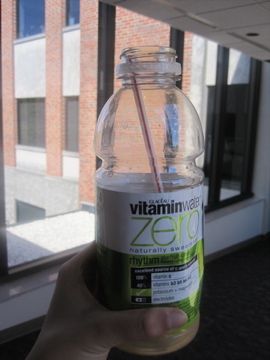 On the way to the car dealership to get some general maintenance done before the long drive to Dallas I tried a new Vitamin Water Zero flavor. I’m a sucker for any new flavors – especially in gum – but I wasn’t a fan of the “Rhythm”. It kinda made my feel sick. Not like yesterday stomach hurt sick, just kind of “ehh this isn’t tasting good in my body” sick. Know what I mean? No? And all I could think about while waiting for my car to be ready (except for the IIN class I was listening to!) was SUSHI. I am very easy to please when it comes to sushi and Trader Joe’s package sushi always hits the spot. 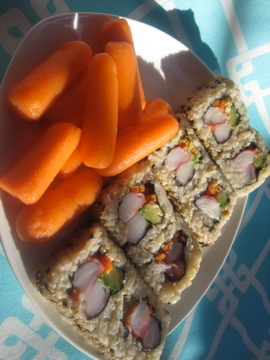 I ran there on the way home and grabbed their brown rice vegetarian sushi which I paired with some baby carrots for crunch. SO GOOD. I’m all for fancy restaurant sushi with high quality fish, but this packaged stuff is just as good to me. Call me unrefined. I am. I had a great surprise at work this afternoon! 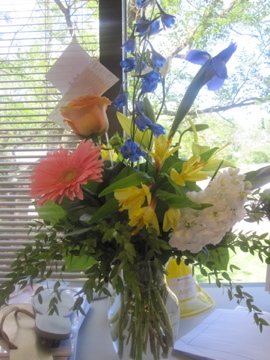 I got a message from the receptionist saying I had flowers at the front desk. Whaaaa? I have no boyfriend. I have not done anything deserving of flowers lately. Do I have a secret admirer? Nope, just some co-workers that got me beautiful flowers as a going-away gift! So sweet of them:) I really will miss lots of the people I work with every day. My replacement officially starts tomorrow so my last few days of work will be training her. As soon as the moving company tells me when they need to pack me up it will feel very real. I’m so excited!! Do you like sushi? Are you picky? I’m all about sushi, however I can get it – fancy schmancy from Shin or the packaged deal from Publix. Since mine are always vegetarian I’m not worried about getting sick from low-quality raw fish, so no worries on that end! I love sushi, make usually. We actually made sushi a few weekends ago at home. It was fun and a lot easier than I thought! I like any maki with avocado the best but am not overly picky. I haven’t had sushi other than that TJ’s stuff actually. The time I tried it I went a bit too heavy on the wasabi! Lol. Last time I got flowers was June 1st for my boyfriend and I’s 3 year anniversary! 🙂 i love the gerber daisy in yours! I love expensive restaurant sushi and all that, but I secretly enjoy Trader Joes sushi too 🙂 There’s a little market near me also that makes the best and cheapest fresh sushi! I really like sushi, but my options are limited as I’m allergic to fish! I have to be extra careful–since it is usually all prepared in the same area, though I do love a roll containing shrimp. I’m SUCH a sushi snob, but I guess it’s because I live in Vancouver! Haha. That being said, I have enjoyed TJ’s sushi when I’m down in the states. It’s not too bad! Haha, I tweeted you earlier today about this salmon brown rice veggie bowl that I saw at TJs! It’s a new product (not in the frozen section)– thought you might enjoy something like that! That was sweet of your c0-workers. I am sure they are going to miss you dearly! Soup is just what the Dr, ordered sometimes! Beautiful flowers! I love restaurant sushi but TJ’s is a welcome option due to the brown rice! That was so nice of your co-workers! Oh, girl. I LOVE sushi – and I’m “unrefined” as well 🙂 TJ’s or Whole Foods packaged sushi always hits the spot for me. Now you’ve got me thinking that’s what I want for dinner tonight! I’m definitely not a picky sushi eater, since I just love anything dipped in soy sauce with lots of wasabi 🙂 And I totally get that sick feeling you’re talking about. Whenever I drink something too sweet, my stomach revolts! Those flowers are gorgeous! That’s so nice of your coworkers! The last time I received flowers was also my first (other than a corsage) and that was last Valentine’s Day. Hmm I wonder if my TJ’s is doing something wrong. I LOVE brown rice sushi but recently tried Trader Joe’s version for the first time and it was noooo good. The rice was like a ring of mush! Maybe I’ll have to give them a second choice. My favorite vitamin water is the squeezed one (lemonade)..have you tried it yet?! I think some of them have too much of a natural sweetener, bitter aftertaste. I also really like the new rise one too!